Any process that you expect to change frequently. A process within a dynamic environment, such as high tech / the startup world, where you expect significant business process changes. Any process that requires a significant number of collaborators. Any process where you intend for users to update logic with Excel-like formulas. Any process where using Google Docs has failed to accommodate your needs for data integrity. 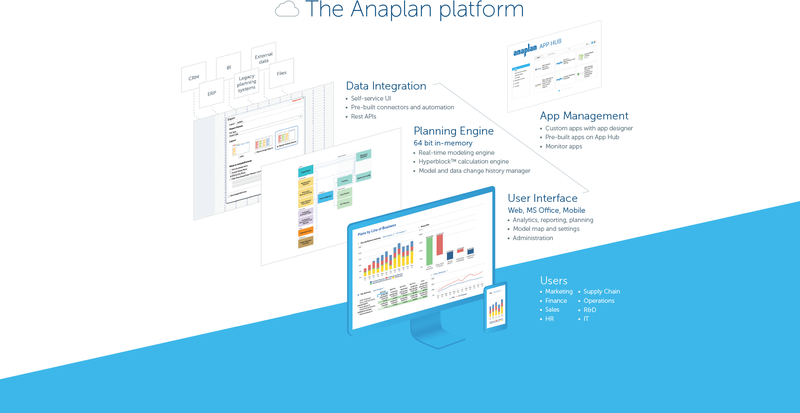 Data visualization - Anaplan has capabilities here, but other tools are more focused on this. Data storage - Anaplan is not a data warehouse and has limits on what you can store. [PowerPlan is well suited for] Any Utility who handles their own Fixed Asset Accounting and Reporting. There are very few specialized solutions in this space that can handle this out of the box. Core functionality and support with PowerPlan are excellent. If you have a firm or service that handles a portion or the majority of your Fixed Asset Accounting and Reporting than this solution is overkill and costly for what you need. There may be other options also if you have a robust internal technology team that is comfortable developing another major fixed asset solution into what you need. Cloud Hosting is also not available at this time and will likely be several releases out and be a major redesign (unstable) at first. Version Control -- by having one cloud-based source for our primary data, there rarely are questions about which data points to use. Everyone understands this and can reference our single source of truth. Flexibility -- Anaplan is great in maintaining a balance between being a formal system, but being flexible enough to update quickly. We adopted Anaplan shortly after our IPO, when our company was still changing rapidly, and have been able to incorporate all of our business process changes into the tool. Collaboration -- Anaplan allows us to have hundreds of users logged into the tool, updating information all at the same time. This was particularly useful during our account based planning implementation, when we had a number of sales managers and reps contributing their forecasts all at once. Allow the use of retirement units for unitization out of the box. Functions well in a Project Centric Accounting Environment. I'd like to see a back button. While there is restore from backup, it is a long process that only Admins can perform. And all users lose changes of course. As an Admin, my #1 request is: why can't we select multiple list members with check boxes? For example, if I have a list of depts., and want to see HR + Recruiting (two list members). Yes, I can build a line item that does that. But every combination of list members must be custom built. Another one that I get asked for are hierarchies for line items. For example, if I have a List on pages, there will be "+" to group items. For example, I might have Finance, HR, and Recruiting, all in "G&A" which I could then open the "+" to expand and collapse (G&A) to show the detail. If I am pivoted on a Line Item on pages, this isn't possible. Another big one I get asked for, is "why can't I save views?!" Of course Admins can, but I think users would really appreciate it this one. Please consider it! The backend technology is dated and requires specialized skills or PowerPlan assistance to develop on. UI is also outdated and not as visually appealing as users are now accustomed to. Reporting is basic in functionality and appearance. There is a dependency in this rating - in that I find Anaplan extremely easy to use, but I've spent the necessary time developing a strong understanding of the platform. Once you understand how to use it, the platform is flexible, easy to use, and fun to use. In nearly 3 years, I have only had 1 issue of being unable to access my model for an unplanned maintenance. Even planned maintenance windows are handled during low traffic hours on the weekend. Everything is calculated in memory in the cloud. It's nearly instantaneous updates when you make changes. The only time things get a little slow is when you have a massive model with very intricate calculations...but "slow" for Anaplan is not what I would call "slow" for something like Hyperion. We used to have Hyperion calcs that ran for 60 mins before you could use data. The equivalent would be 60 seconds in Anaplan. I feel like the support team is a little lacking in product knowledge. Several times I have contacted them to get help, and ended up finding a solution to my own problem before the team could get back to me with anything useful. I have also submitted a few bugs, and never got updates to when they were fixed in later releases. The in-person training is simply not worth the cost. After a few weeks of playing in Anaplan, I went to the basic training and knew more than the person teaching it. a year down the road, I was the first person to complete the advance training, and again could have been teaching the class better than the person running the session. Spend some time on your own trying out different things and you will get all the understanding you need to be successful. Honestly, having implemented Anaplan at another company, I knew it would suit our needs here and convinced management to get the tool on that basis. We already use a mix of Cognos BI, Tableau, and Excel ... but our need was something apart from what those can provide. Oracle Financials (E-Business Suite) is a very Robust ERP solution that has better integration, reporting and functionality than PowerPlan. It also operates on a more Robust Technology Stack. The Fixed Assets Module is a great solution but lacks support for Utility Specific features and functionality, so much so that we chose PowerPlan to take over this specific functionality while still utilizing Oracle for the Majority of our Project and other Accounting Functions. It's going to handle most of what you can throw at it. The problem lies in the sparsity of some datasets. When you have over 5ish dimensions of sparse data, the size of the model gets bloated for not much value. In several cases, I have had to adapt my model to account for sparsity in a way that minimized use of space, but also made interacting with the data more cumbersome. Better Fixed Asset Reporting to Provide to Rate Commissions. Allowed us to embark on a major Unitization initiative and re-design of our retirement catalog. Focus the Support team on other technologies due to the stable nature and good vendor support. Platform - Align business investment to corporate and departmental goals. Gain control over IT projects and reduce time and cost overruns. Easily manage IT shared service costs and allocations. Quickly report progress and impact to the business with live scorecards. Continuously optimize teams and priorities to deliver the most relevant value.